Miss Imperial (17 Oct 06 - 10 Sep 07): "Oh, look out! you rock 'n rollers." "Oh, look out! you rock 'n rollers." you're going to get older." Ch-ch-ch-ch-changes. 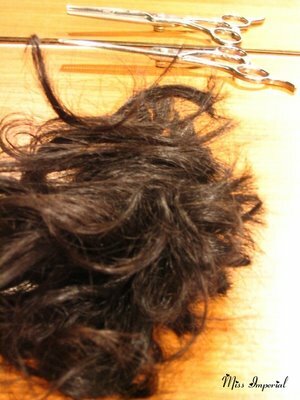 Today I cut off all my hair, or most of it. The photo is only a fraction. Six inches shorter and half a pound lighter; my hair went from big to small in a matter of moments. I suppose I felt like a new start called for a visual aid: my head as a metaphor for my life. TRACK LISTING: David Bowie, "Changes"
cutting your hair is a good thing. makes you feel like something is different about you. you want to show it, but have no idea how. i shave my head when i'm in those states. Shaving one's head! I always consider doing it, then chicken out. ...so instead you shave mine! Well, once. Here's the funny part: instead of the photo of my hair, I almost scanned and posted the photo of you sitting in the high school stairwell with the aforementioned shaved head. Then I thought about release forms and whether you would or wouldn't want your daughter to see that photo in the future (I made you pose a bit too much, I think). So I didn't post it. But yes, if you can't shave your own head, shave someone else's! I don't have that photo. Maybe I don't want that photo. Good thinking on the no-post.